Water Bar & Public Studio is creating space to reconnect people with water and community. Water Bar & Public Studio is the world’s first tap water-only bar. It's a warm and welcoming social space where drinking water is always free and available to all. While visitors share stories over tasting flights of tap water, our “water tenders” encourage new and deeper connections with local water sources and systems. We activate Water Bar & Public Studio with unique community-driven events and programs that deepen relationships with water and place, bridging the realms of culture, science, policy, activism, and everyday life. We take this approach on the road with our Pop-up Water Bars, which appear at community forums, conferences and conventions, art museums, festivals, an annual 12 day Water Bar at the Minnesota State Fair that serves water to over 20,000 people, and anywhere else we are asked to be. Out of this work, we create tools and resources for an ever-growing intersectional network of folks who are working to transform the culture of water, one glass at a time. We hope you will join us! Join our Patreon Community and #ServeWater together. We are using Patreon to deepen reciprocal relationships with peers, supporters, collaborators, and partners. When you invest $5 dollars a month (or more) you directly support our collaborative community space in Minneapolis and grow our capacity to effectively share tools, resources, and learnings with more communities across Minnesota and the United States. Shared Space: When you join our Patreon Community, you'll immediately gain access to meeting and work space during designated hours (currently Fridays from 10am to 5pm). The more Patreon support we receive, the more days and nights we can be open! Shared Learning: On Patreon, you'll have access to in-depth online conversations, interviews with Water Bar artists and other partners, critical writing about work in progress, and connection to a network of others who care. You'll also be invited to special events and gatherings created by and for this learning community. The more Patreon support we receive, the more of these learning resources we can create. Shared Work: As part of our Patreon Community, you contribute to the work of creating an emergent social space and network that serves water. We encourage you to use the connections and strategies you gather here to further your own creative and community work. The more support we receive, the more diverse and vital this network will become! For more details, visit the tiers section of this page. Banner photo by Russ White. Reward photos by Joe Bielawa, Sharon Mollerus, Andrew Writer, Amanda Slater, NOAA Great Lakes Environmental Research Laboratory, and Lee Vue. Access to Water Bar Patreon Community. Photo of your choosing on our Patreon Community Wall at Water Bar. We will send you a handmade Water Drop screenprint customized to your tap water source. We will send you a Water Bar tee shirt. 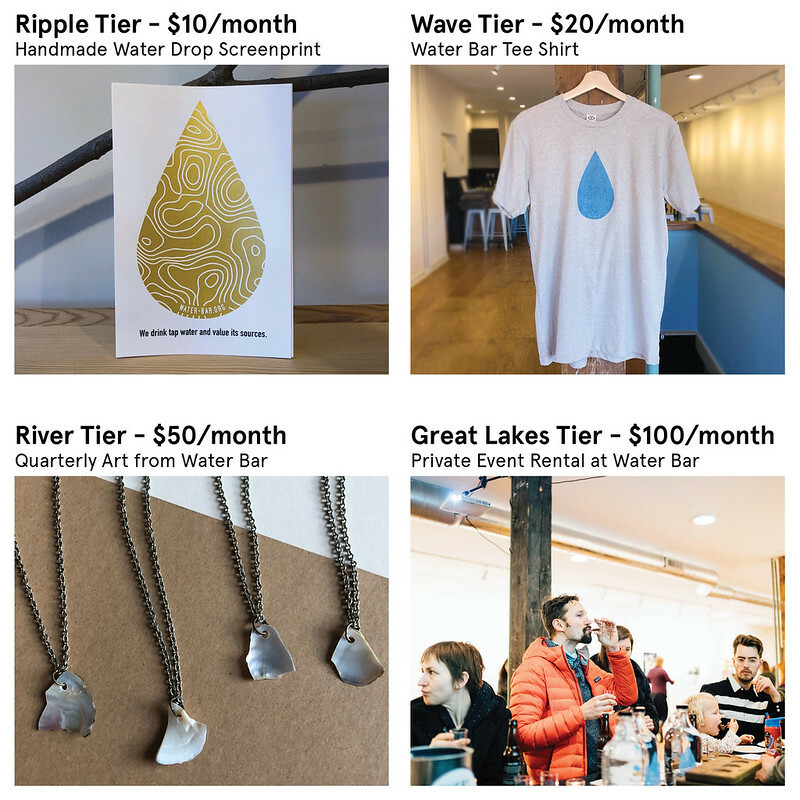 The Water Bar River Package: We will send you one new creative work from Water Bar & Public Studio artists and partners every three months. These might take the form of art prints, publications, jewelry, posters, and who knows what else! We will help you host a private or public event for up to 100 people at our Storefront! When we reach $50 a month, we'll start posting weekly features about our Water Bar Patreons.